MICROBE-LIFT/Artemiss is a unique, herbal, immune-enhancing stimulant, which reduces bacterial and fungal infections. Will help boost the natural immune system of the fish with no risk of building up future resistance as can occur when antibiotics are used Will help to drive pathogenic bacteria off the fish, and, withouta host, ultimately the bacteria will die Stimulates and accelerates regeneration of damaged tissue until no trace of the wound remains 100% Natural Expellant for Bacterial Diseases Provides a chemical-free treatment effective against bacterial diseases including: Bacterial dropsy Bulging eyes Fungus Ulcers Milky skin Mouth rot Fin/tail rot Raised scales Shake Well Before Using Directions: Shake thoroughly prior to use. Remove any carbon and/or zeolite from filters. Keep biological filters operational. Dosage Add 1 mL of MICROBE-LIFT/Artemiss per 5 gal. (19 L) daily for 10 days, or add 1 tsp. (5 mL) per 25 gal. (95 L) daily for 10 days. In severe cases, a longer treatment period may be required until visible results are achieved. Dosage (New Introduction) When adding new fish to a quarantine or aquarium tank, alternate adding MICROBE-LIFT/Artemiss and MICROBE-LIFT/Herbtana at the standard dosage, 12 hours apart, until 2 doses of each product have been added. This will act as an immune system stimulant and destressant. 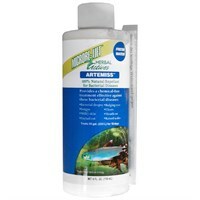 MICROBE-LIFT/Artemiss is safe for all aquatic life. It is a great aid to use when acclimating fish to a new environment. MICROBE-LIFT/Artemiss has a shelf life of 2 years, provided it is kept at room temperature and stored in its original bottle. Do not allow to freeze. Cautions Do not use with any other medications or treatments Do not use with any algaecides or copper based products Avoid contact with eyes. If contact occurs, flush eyes thoroughly with cold water Keep out of reach of children This product is intended for use with all ornamental and aquarium fish only, and may not be used for fish intended for human consumption.